Sunny and Chilly [Frost this morning], Water temperature 68* and clear. I have had a lot of people want me to start posting again so here we go. Today we started out pulling boards and hooked up with the largest Striper right off the bat in about 20 foot of water. We boated it and within the next 15 minutes we caught 5 Largemouth's 15 to 20 feet deep up to 5 1/2 pounds. That was enough of that so I moved on. Since the fish were not aggressively hitting the boards this morning due to the cold front driving them off the shallower flats I moved out to slightly deeper depths and we started hooking up. 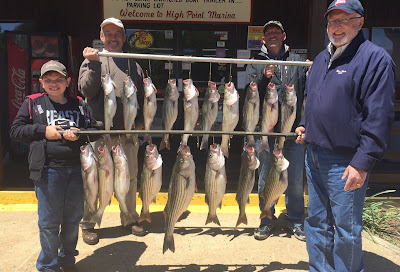 I was happy just to have action on a bluebird cold front day like today but the Stripers cooperated and we limited out before lunch. 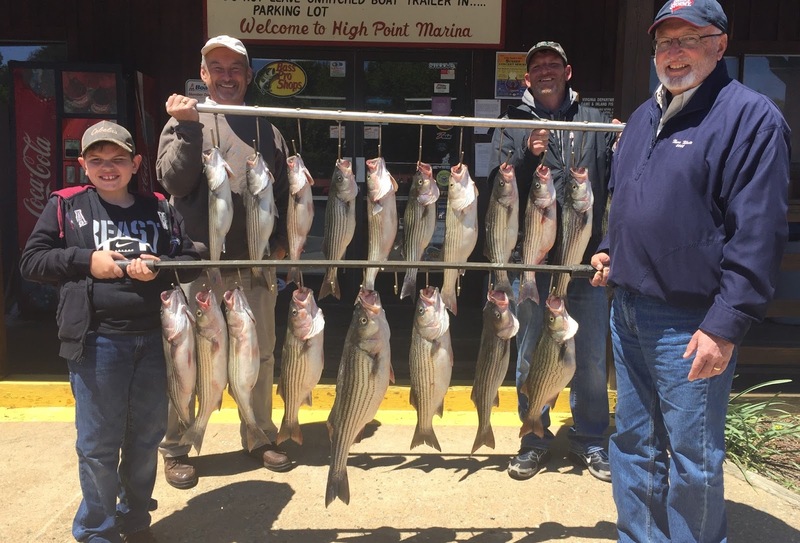 Stripers still have not spawned and are basically somewhat confused so expect plenty of spawning action to come before the fish retreat to their summer patterns. The bass we caught have not spawned either and were still main lake on ledges next to the channels, Whats up with that??? Funky spring weather I guess.